The 33.65 metre sailing yacht Fidelitas, listed for sale by Jochen Brill at Northrop & Johnson in Palma, has been sold in an in-house deal. Built in steel and aluminium by Dutch yard Jongert to a design by Nico Stockman, Fidelitas was delivered in 1994 as the second hull in the yard’s Passepartout series and has been serviced annually since. An interior by Peter Sijm accommodates up to eight guests in three cabins comprising a large master suite and two twins plus two Pullman berths, all with entertainment centres and en suite shower facilities. A further two cabins sleep five crewmembers. The cockpit is very spacious, providing seating in a horse-shoe shape around a large dining table, which hydraulically lowers to a coffee table when necessary. Here there is also a wet bar, providing all the necessities for al fresco cocktails. From the cockpit, stairs lead down to the saloon with comfortable seating to starboard, with views up to wheelhouse. The saloon also features a 65-inch projector screen available for those relaxing movie nights. At the bow of Fidelitas the tender is stored in a well, ensuring the views are uninterrupted. 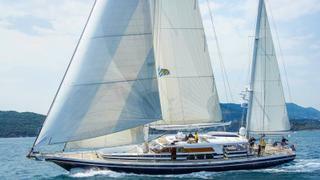 Unusually for a sailing yacht of her size, she also has a flybridge, providing a further relaxation area for guests. Under power, a 534hp MTU diesel engine gives her a range of 2,400 nautical miles at her cruising speed of 8.5 knots.